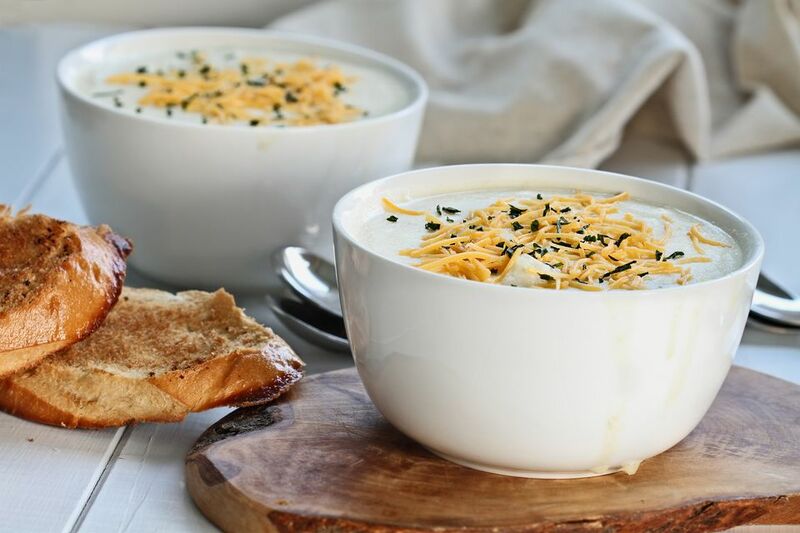 This super-easy vegetarian homemade potato soup topped with slowly melting cheddar cheese, green onions, and fresh chopped parsley is a potato soup that the whole family can eat. And, with little more than potatoes, onion, and garlic, it's also a great way to stretch your family's meal budget. However, this soup is probably best served as a light lunch alongside a fresh green salad, as it's not really a full meal in itself. With the cheese and green onions, this soup may remind you of stuffed potato skins. It's a low-sodium soup since the only salt added is to taste at the end, but check the ingredients of your vegetable broth if you're watching your salt intake. In addition, this vegetarian recipe is also gluten-free (as long as you use a vegetable broth which is gluten-free). In a large soup pot, sauté the onion and garlic in the olive oil for 3 to 5 minutes, until onions are soft. Add the chopped potatoes and sauté for a few more minutes. Add the vegetable broth, bay leaf, and season with salt and pepper. Bring to a boil, then reduce to a slow simmer. Cover and allow to cook, stirring occasionally, for 20 to 25 minutes, or until the potatoes are very soft. Carefully remove the bay leaf, and transfer the soup to a blender or food processor (or use an immersion hand blender if you have one). Working in batches as needed, carefully process the potato mixture until smooth and creamy, or until the desired texture is reached (you may prefer a few chunks instead of a perfectly smooth soup—it's up to you). Taste and season lightly with salt and pepper if needed. Return the soup to the pot and add cheese. Stir over low heat until the cheese is melted. Garnish with green onions and chopped fresh parsley. If you like this soup, you might also want to try this low-fat potato and cauliflower soup recipe, or sample one from the collection of the most popular vegetarian soup recipes. If you're looking for something a little more filling, try bean and barley soup or a vegetarian minestrone soup.